Monday, February 11, 2013: This is the morning we leave Tucson, at least for the next few months. However, before we hit the dusty trail, a bit more from our stay in this, one of our favorite wintering over spots. First off the weather has been unbelievable…..warm days and cool nights with zero rain. However reports from back home have our more hardy friends and neighbors dealing with Superstorm Nemo. 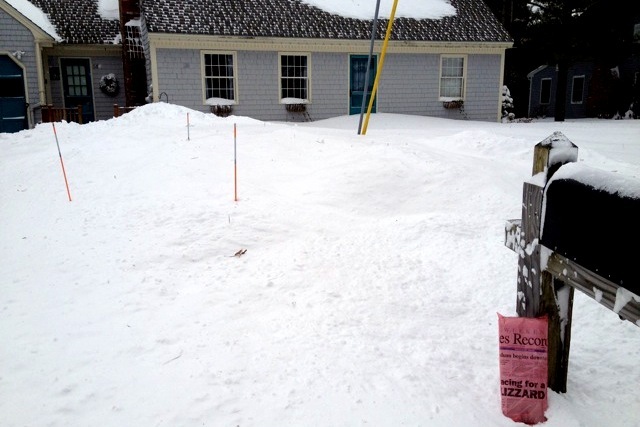 Our son and family southwest of us received just shy of three feet of snow and on the coast our place got a little over two feet. And with the gale force winds the drifts were very high in spots. In order that we share their pain our neighbors snapped a photo of our place. Both our neighbors across the street and Kim sent photos of our place to ensure we knew exactly how bad it was. Note the validating headline on the newspaper hanging off the mailbox post. 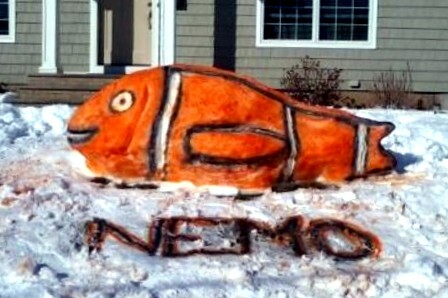 The next photo really portrays how bad Superstorm Nemo really was! Yea, the photo looks a bit fishy to me as well…..but hey, if The Weather Channel can name every silly storm it desires to then they should be made fun of! Here are a few other items of note about our “home away from home” this past week. 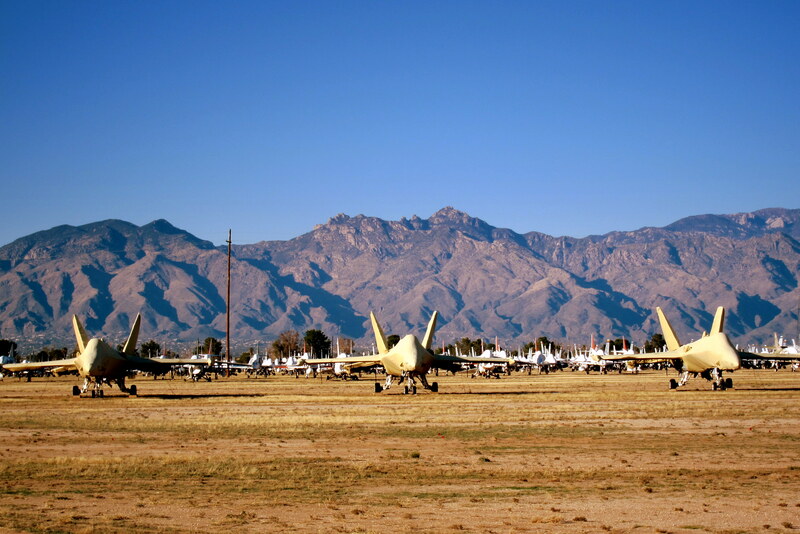 The USAF campground we stayed at shares a common border with the famed Davis-Monthan Air Force Base “Boneyard”, a repository of all the out of service aircraft in the US Military’s inventory. 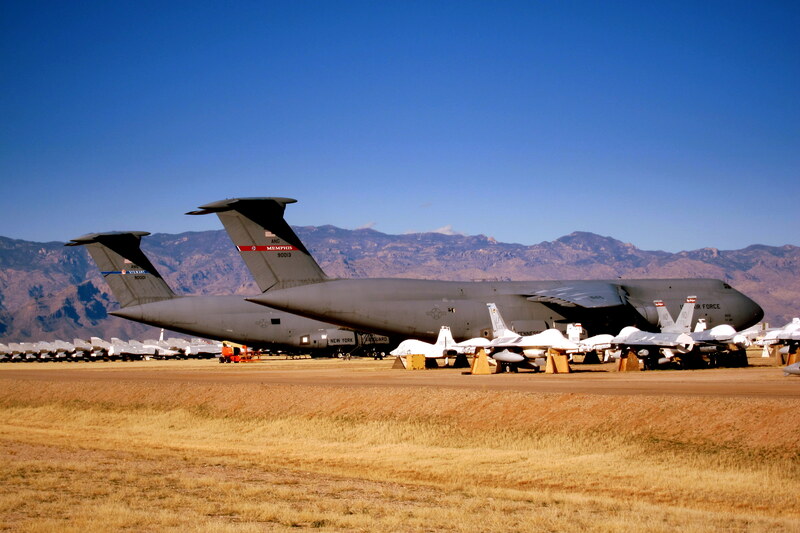 The following photo came from the USAF archives and shows a very small portion of the collection. 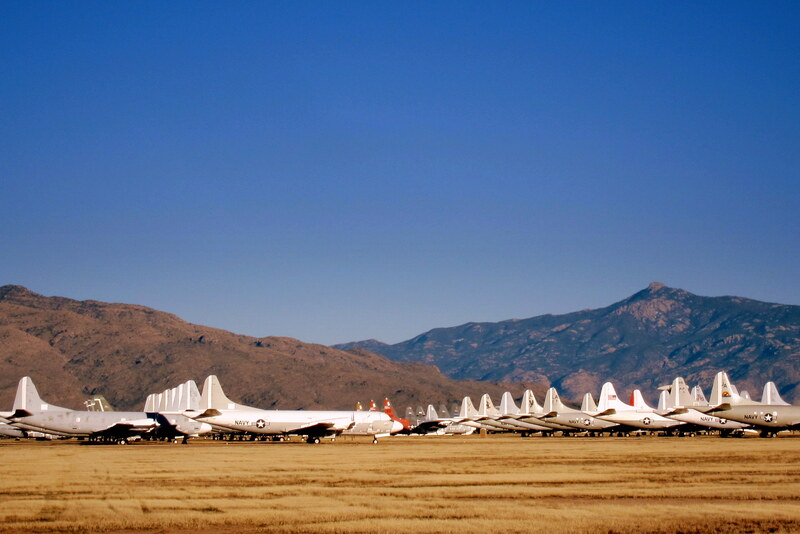 The Boneyard came about due to the military drawdown following WWII which created a corresponding surplus of combat aircraft. 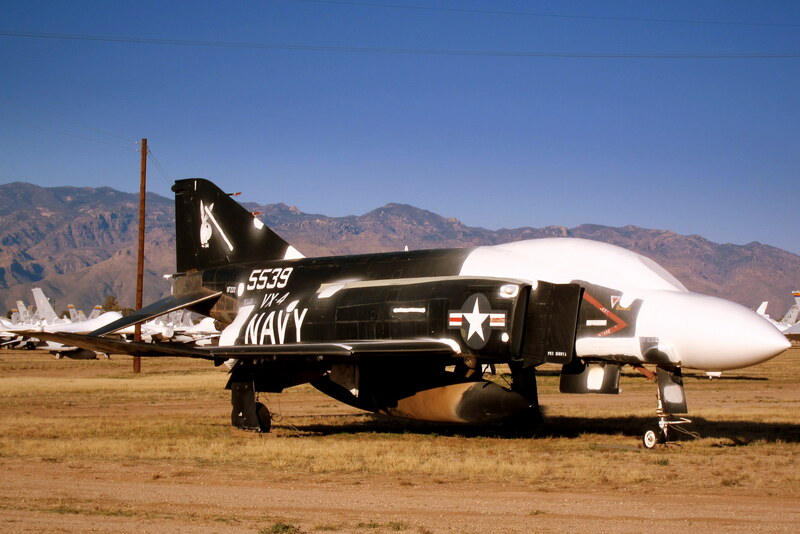 Some were scrapped, some were sold to the general public and others were sold to “friendly” nations. However, many needed a place to retire and live out their remaining years in a warm dry climate……sound familiar? This 2,600 acre storage lot has gone by many different official names over the ensuing years but is generally referred to as “The Boneyard”. 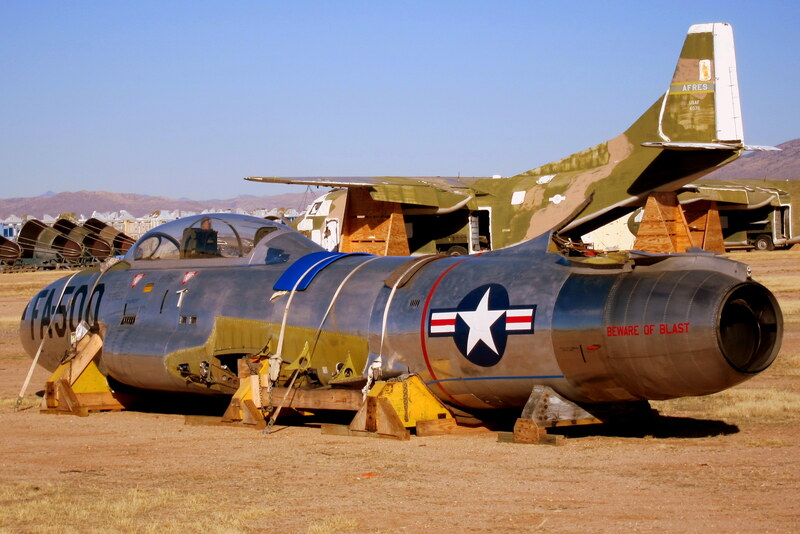 Housed here in a mummified state are over 4,400 aircraft from all branches of the US Military. Most of these planes are laid up and maintained in such a way that they can be reactivated if and when needed. 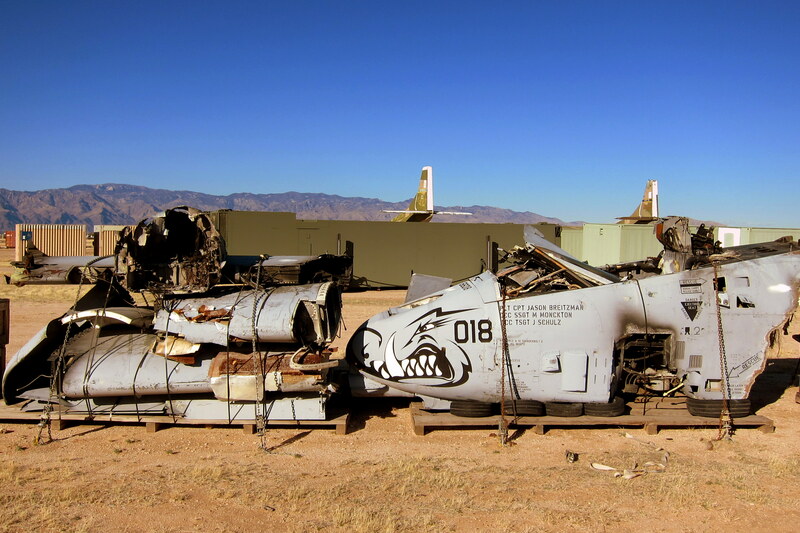 Intrigued with the concept of a giant scrap yard of cool military hardware, I took a bike ride about the area. I noticed some big planes. I noticed some not so big but very fast planes. I noticed some wrecked planes. I noticed some scrapped planes. And I noticed some classic old and very fast planes. Then there were the planes with propellers……some would call “real airplanes”. These are the planes that a few of my friends used to fly and work on back in the day and the type that would circle aimlessly over my home before Brunswick Naval Air Station was BRAC’d. I counted 53 of these P-3 Orion patrol aircraft sitting in the desert far away from their natural element! Kinda sad. 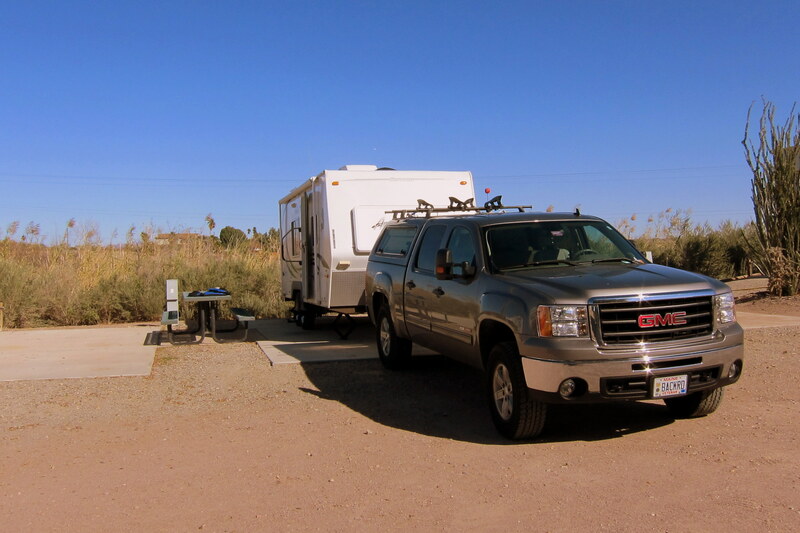 Returning from my bike ride with a desert inflicted flat tire, I stopped to talk to one of our campground neighbors. 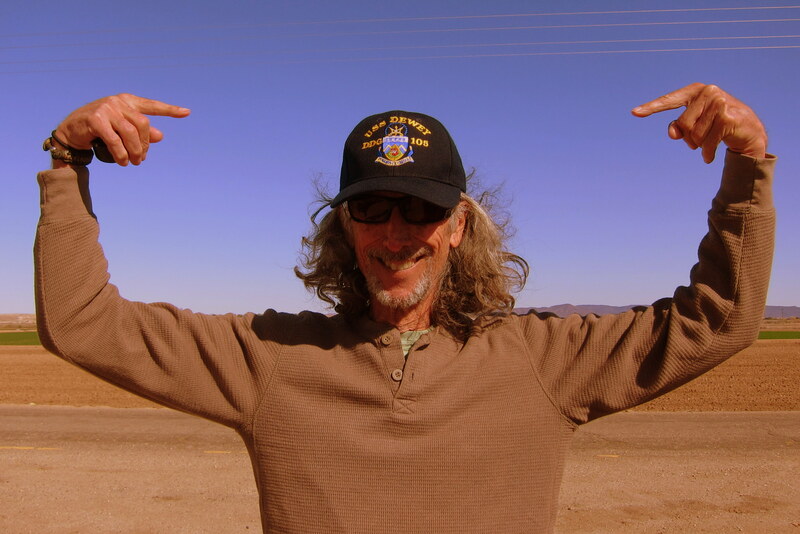 Mike is a retired Navy C-130 pilot, lives in Washington State and winters in the southwest. 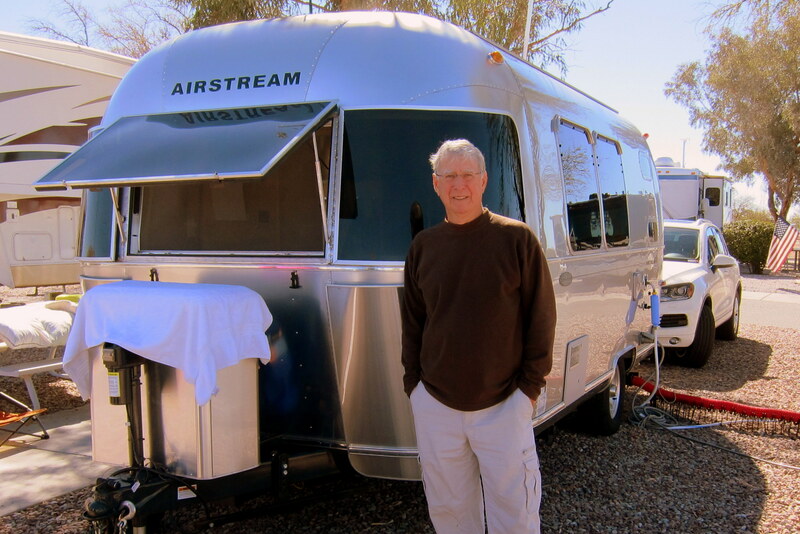 However, the thing I found most interesting was that he pulls his 20 foot Airstream with the VW Touareg you see to the rear. Not a traditional tow vehicle but Mike reports it handles the heft of the trailer very well with a Turbo Diesel 3.0 liter, 225 horsepower engine putting 406 pounds of torque through an 8 speed automatic. Nice powerful rig and he enjoys great gas mileage as well. Well, as mentioned, this morning we are off toward the land of the setting sun. It is 0945 and the weather is partly cloudy with a temperature of 48 degrees. 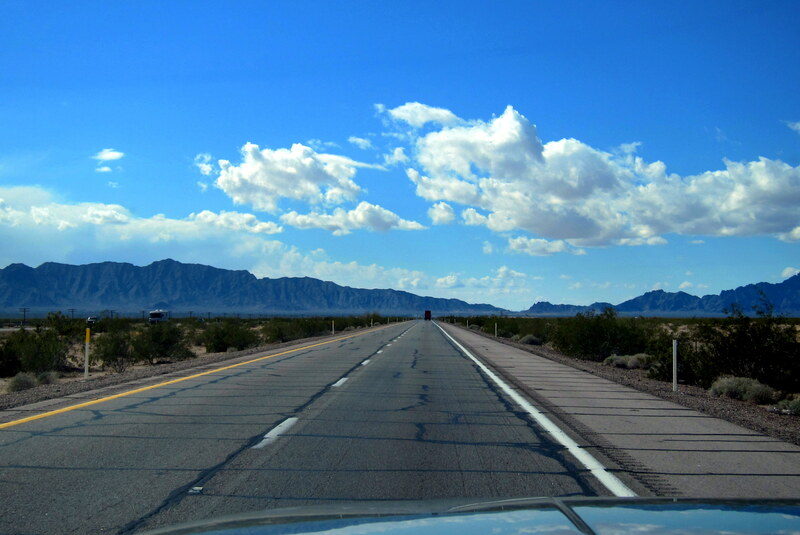 After winding our way through South Tucson, we jumped on I-10 and headed west. 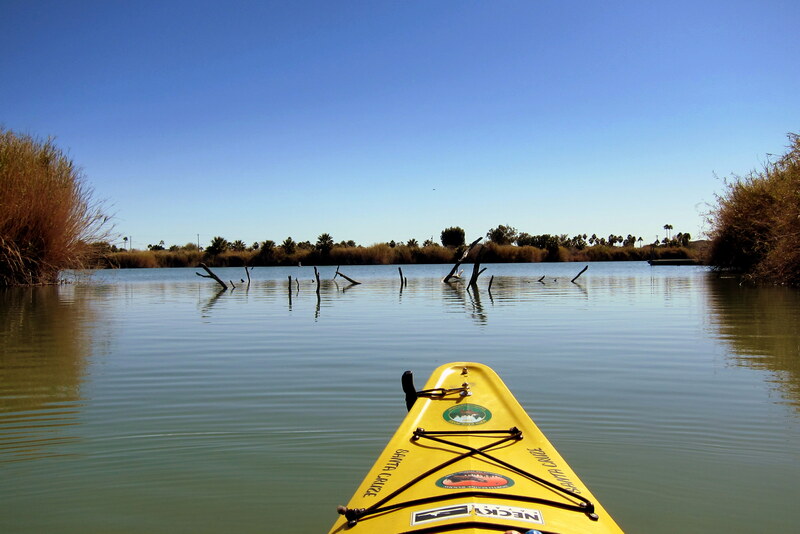 Today’s destination is Lake Martinez on the AZ-CA border just north of Yuma. Being a Monday, the traffic was light and the driving was easy. Just south of Phoenix, we moved over to I-8 and continued our westerly trek until we moved over to US-95 and a variety of dirt roads toward our intended stop. At 1520 we pulled in for the night and set up in a rather unique campground for a few days. 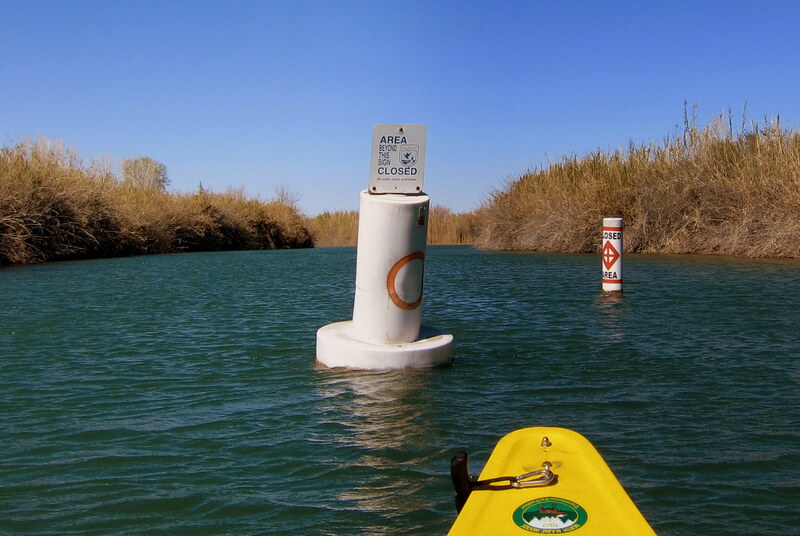 Tuesday, February 12, 2013: Lake Martinez, AZ: Lake Martinez is an impoundment created by the damming of the Colorado. 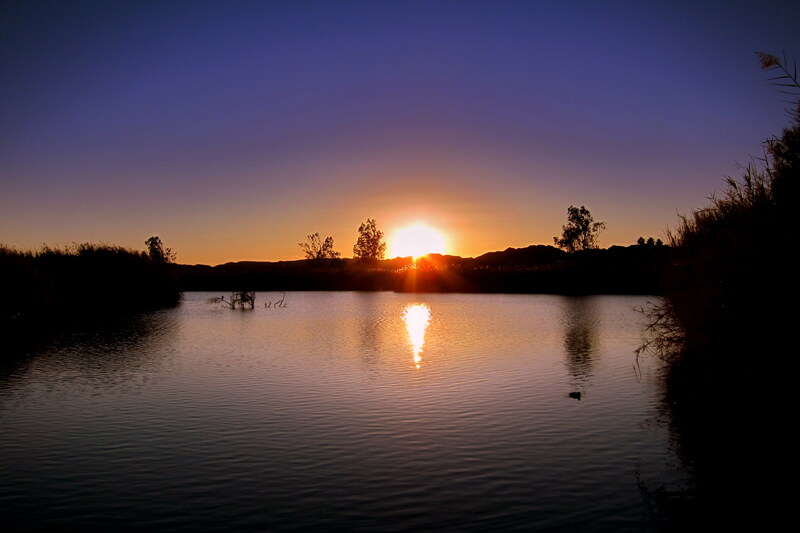 The resulting lake covers approximately one square mile and has an average depth of ten feet. 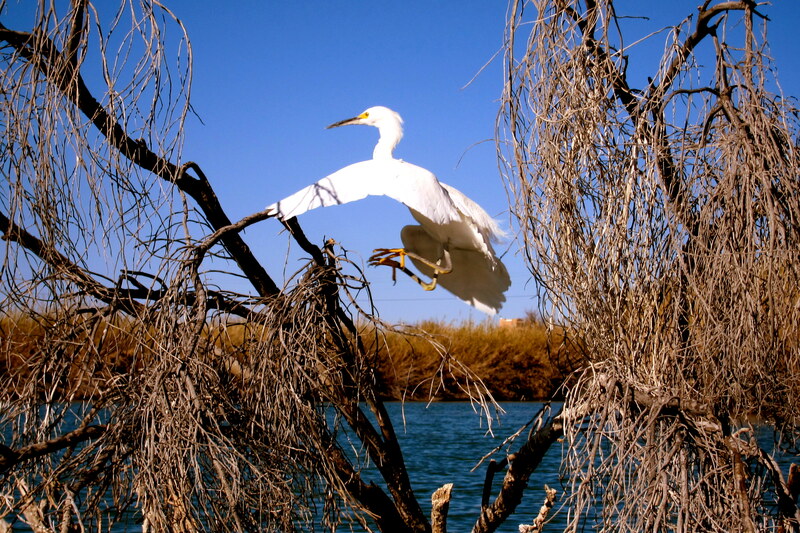 Being so shallow, Lake Martinez is the perfect waterfowl habitat and part of its western shore has been designated as the Imperial Wildlife Refuge. Well, all this created the perfect paddling opportunity for Bill and his little yellow boat. The lakes irregular shoreline provided many bays and inlets to explore. And being an impoundment there were many submerged trees that had died off leaving a forest of spindly trunks. Soon, I came upon an old coot eating lunch; nope, not a fellow retiree but an actual American Coot enjoying his fresh caught crayfish. I could tell this old coot was not from the south as there wasn’t a Tabasco bottle in sight! A few hours later, I witnessed this huge bird soaring and diving about. I believe it might be a Snowy Egret; however I have also referred to it as a Heron so not sure…..I bet either Dave or Dew will be able to clarify that…..please? Anyway I noticed later that the huge white bird had eventually come to rest on the branch of a submerged tree where it joined its mate. I was able to get quite close in stealth paddle mode so my puny camera was able to get an acceptable shot of the pair. After a while, I came to the southern edge of the Imperial Wildlife Refuge which was closed to the public and had to turn around. Returning to the campground, as the sun was setting in the west, made for a perfect end of a perfect afternoon on the water. Back at camp, Kit enjoyed the day as well. I felt guilty leaving her all alone like that but somehow she managed dealing with the peace and quiet and was able to get in some reading and knitting! 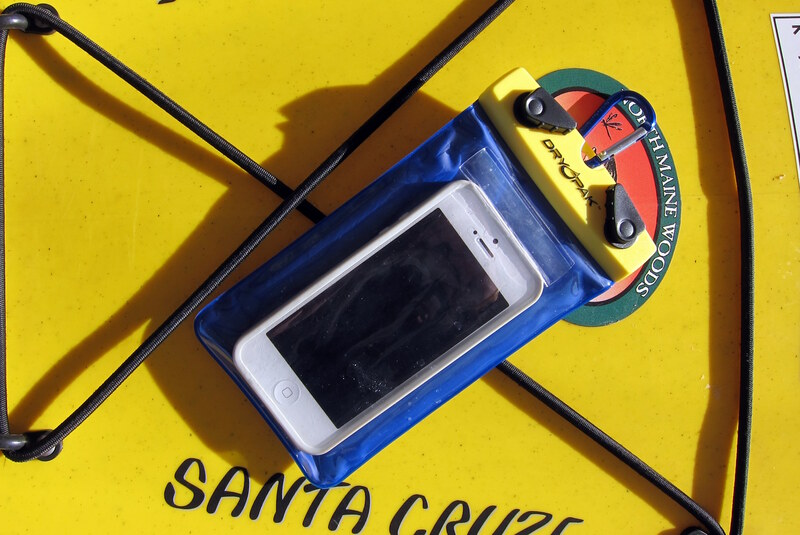 I have one additional note that may be of interest to folks who like to bring expensive and delicate electronics on the water. Before leaving Maine I picked up some waterproof enclosures for my phone and camera. In the past I relied on traditional Dry Bags, which always were a pain to unfold and rummage about in. These relatively inexpensive and purpose designed pliable containers open with a twist of two knobs and the best part is that all your touch screen controls work right through the clear plastic cover. The size shown worked perfectly for my phone and the next larger size fit my Canon S-95 like a glove. Wednesday, February 13, 2013: Up early and on the road by 0930. It is crystal clear and cool with temperatures only in the 40’s. Heading back south to the interstate we bypassed Yuma and headed west on I-10, soon passing into the Pacific Time Zone at the California border. As a happy coincidence, Dew and Bea were returning from their California adventure at the same time and on the same interstate. So, utilizing some cell text coordination, we were able to connect at an off-ramp near the town of Winterhaven, California. Always a pleasure seeing these two, however I had an ulterior motive to make this desert rendezvous work. 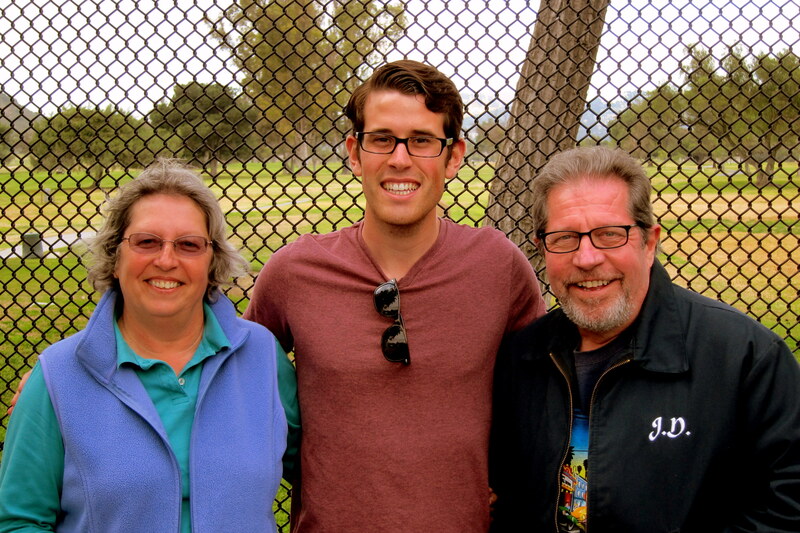 You see, one of the folks we visited in Tucson was the nephew of my mom’s third husband. Bonnie and Dave have been wonderful in visiting mom from time to time and we wanted to repay that kindness by treating them to dinner. While visiting we discovered that David’s daughter, Danielle was serving in the Navy on a destroyer similar to one that I spent many years working on at Bath Iron Works. The name of her ship? The USS Dewey DDG-105! So they thoughtfully gave me a ships cap to pass on to its namesake. The old submariner was thrilled and immediately popped it on his head with a big smile. I have often believed that Dewey lamented the fact that he didn’t serve on an actual ship, but on those objects that were designed to sink. So now he can at least pretend that he belonged to the real Navy. OK, that last part is to see if Dew really reads these journals, or not. Back on the road within the hour I noticed that the GPS altimeter read minus 48 feet! No wonder Dewey likes the desert…..he’s used to living below sea level! Stopping for lunch at a rest area near El Centro we heard a lot of jet aircraft flying about, not unusual since El Centro Naval Air Station is a short distance away. However in this case the planes actually were part of the Blue Angle Flight Demonstration team. They use the perfect weather and unpopulated surroundings to prepare their new team members for the upcoming show season. The only time they flew over the rest stop, I couldn’t get my camera out of the holster on my belt fast enough to snap a photo…..drat! Back on the road, we made quick time of the remaining miles as we passed up and over the Laguna Mountains toward the left coast. 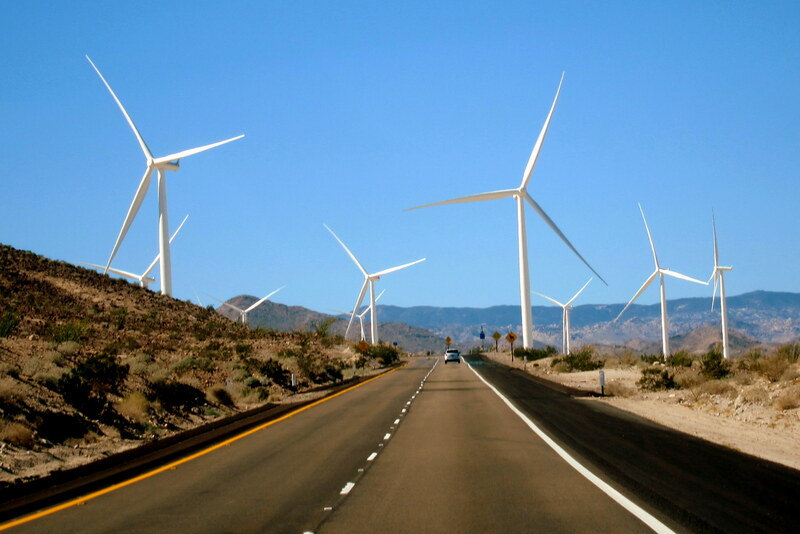 As we motored along, we ran into many wind turbine generators. Well, not literally, because that would hurt! They were everywhere but none were actually rotating even though the wind was at about 10 knots? Not sure what was up with that! However I did have the hunch that Don Quixote would have gone nuts around here, you know if we lived in California instead of Spain and if he actually existed. Encountering the California rush hour traffic we so vividly remember Kit and I made our way toward the Admiral Baker Field campground in Mission Valley and set up for a week of exploring our old hometown! 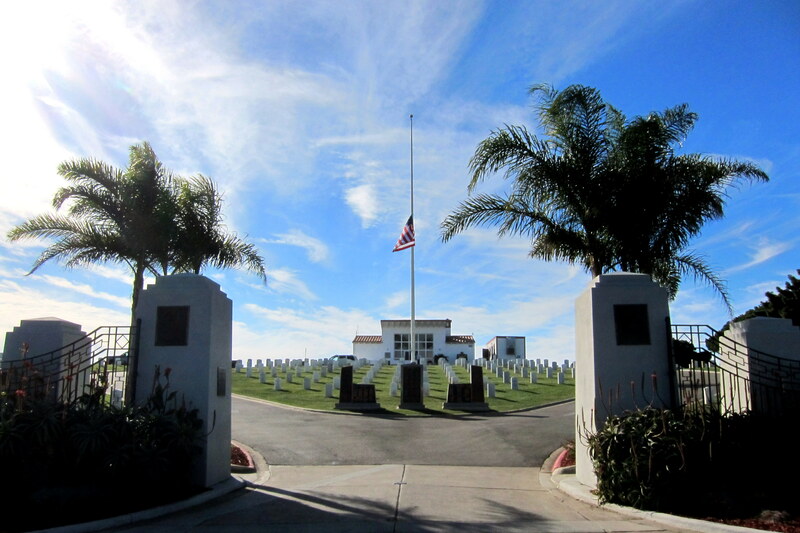 Thursday, February 14 through Tuesday, February 19, 2013-San Diego, California: Admiral Baker is a Navy Recreation Facility featuring, in addition to the very nice campground, two 18 hole golf courses, various athletic fields and picnic areas, and a large swimming pool. Since we rarely make reservations we were told that we may have to move about over the next week to accommodate folks that plan ahead better than we do. However, road magic once again intervened and we were able to stay put through our entire stay. 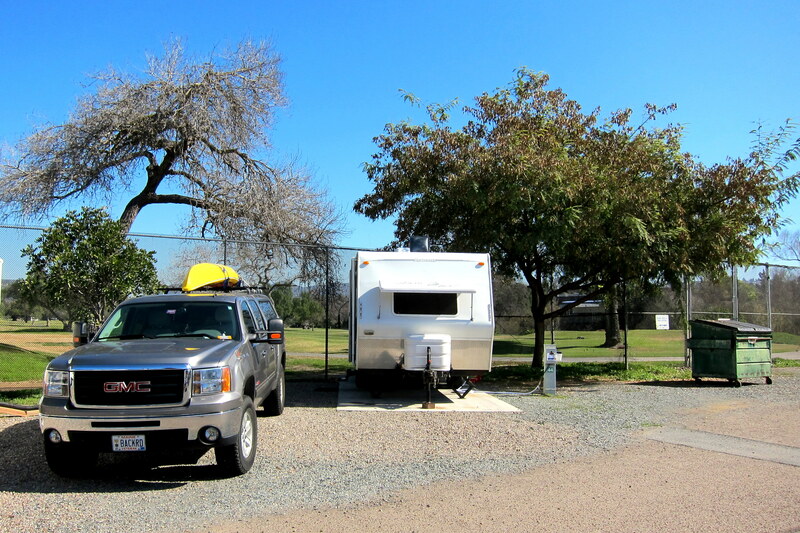 We often have the smallest RV in any given campground which makes us feel a bit inadequate…..well at least until we witness the bigger rigs being turned away due to space restrictions in National Parks and some older commercial facilities. However in this case our neighbor to the right tows about that little green windowless RV…..stinks to be him! Literally!! That patch of green you see to the rear of our trailer in the above photo is part of one of the golf courses. The way our trailer was positioned we were able to enjoy the antics of many golfers as they teed off. I think it’s called teeing off because after they hit their little white ball they generally became very “teed off”. I’m not a golfer, but I do enjoy watching Homo sapiens in their unnatural habitat, so some amateur observations follow. First off most everyone that teed off while we were observing took a number of practice swings before actually hitting the ball. Not sure what that was all about…..what if one of the practice swings was “the one perfect swing” and it was wasted swinging at the air? Also…..what is with all the yelling and body gyrations after the ball is hit? Like a rocket, once the ball becomes airborne nothing can change its ballistic flight! And why do they all yell “fore” when they only hit one ball? Also, why do they hit the ball, only to chase after it only to hit it again, and again, and again…..until they end up at the clubhouse bar? Seems like they would save a lot of time and frustration if they drove their little go-carts about for a while stopping occasionally at the bar until they all ended up in one of the little ponds scattered about. Oh, and I also noticed that the older golfers walked and the younger ones rode little the little carts, seemed backwards to me. I do have a confession to make however. Some of the little white balls ended up on our side of the fence and I would collect them. Then when a group was headed to a nearby hole with the little flag sticking out, I would lob one or two over the fence….pretty comical I thought. However they weren’t laughing and they had clubs! Most of my young life I was admonished by my mother for attempting to play with my food…..now that I’m all grown up, that responsibility falls on Kit’s shoulders. However I still try and get away with it. Being as San Diego is the town Kit and I grew up in and then later lived in as adults, there are a number of family and friends we need to see. One of those was our neighbors across the street from us when we lived in the Clairemont area back in 1972. Carl and Angie, being 25 years our senior, took us under their wing and helped us out a lot. They still live in the same house! 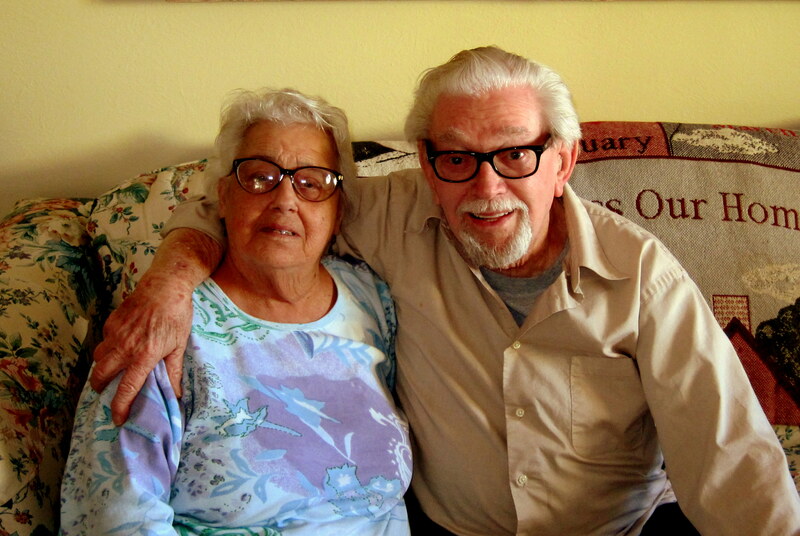 Carl will be 90 in a few months and both are doing well. It was very enjoyable to catch up with them and reminisce about the old neighborhood. Most of my family has left the area but Kit has a number of family still about. Her brother John and his girlfriend Lu, along with her nephew Matthew all came by to see us. Since it’s hard to cook for a group in our little trailer we all went out to eat at a San Diego institution called Filippi’s. 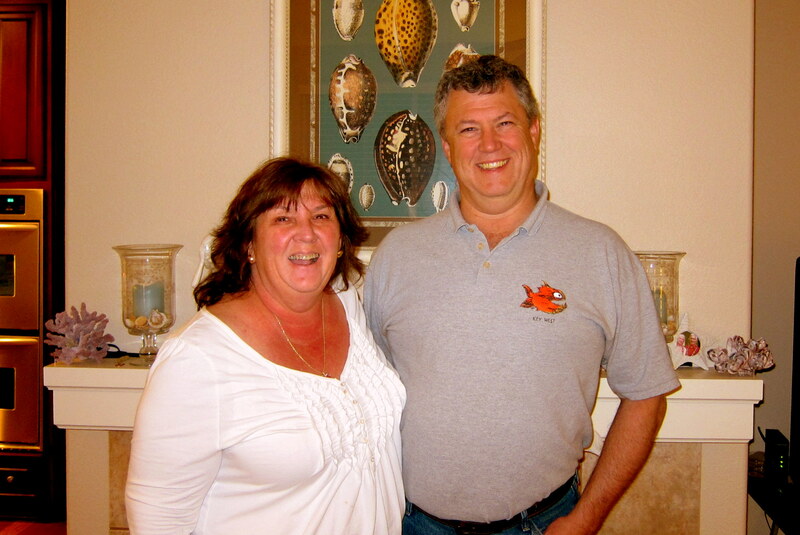 We were also able to visit my best friend from childhood when we visited Rod and Gloria at their east county home. Rod is getting ready to retire after many years in the trucking industry and Gloria, a Mexican American is retired. They treated us to an excellent homemade Carne Asada meal. 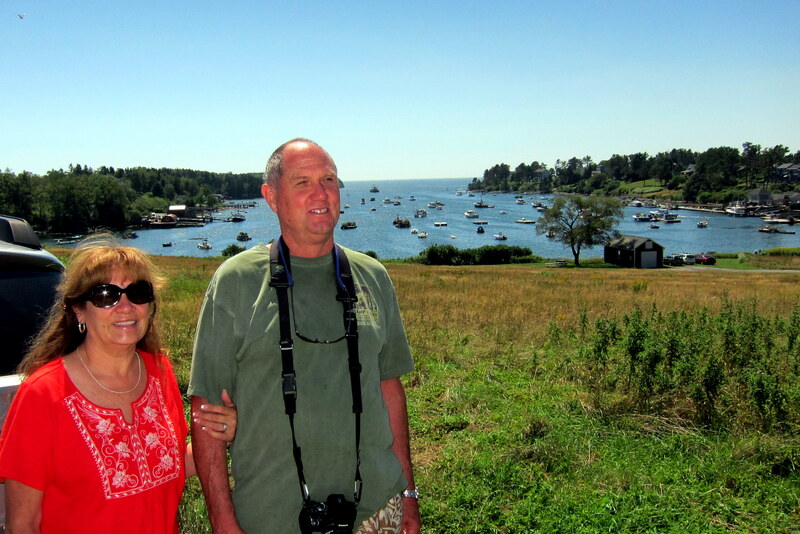 Rod and Gloria came to Maine to visit us a few summers ago. The above photo was taken during that trip…..a great time was had and we hope the come to visit again in the future. We took one day and did some tourist stuff. 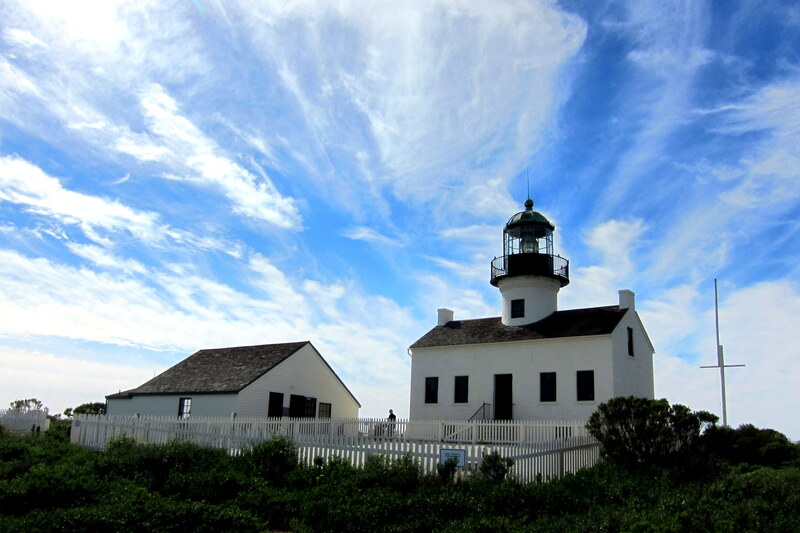 An area that we hadn’t been to in over 40 years was Point Loma and the Cabrillo National Monument, home of one of the most photographed lighthouses in the country. This navigation aid only had a service life of a few years due to its high location which caused it to be obscured by clouds and fog quite often. So another lighthouse was built down on the shoreline. Still in use today, it is not open to the public, but equally as picturesque! 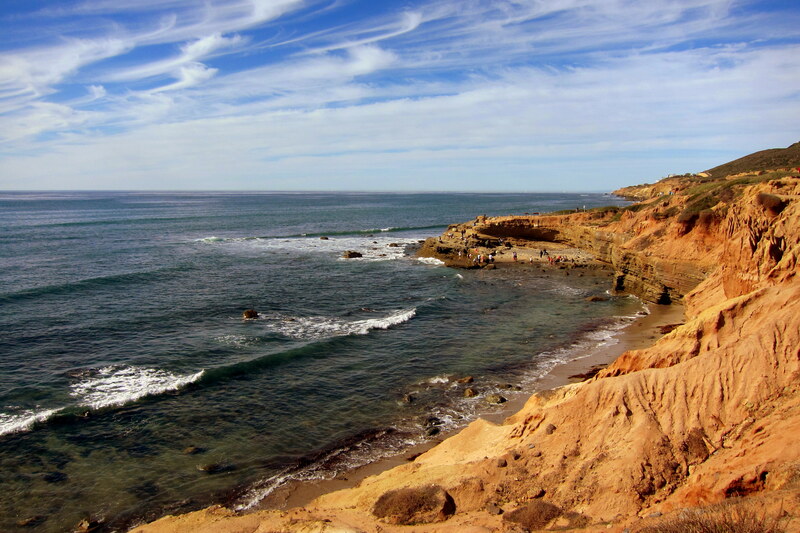 Point Loma is a peninsula of land that separates San Diego Bay from the Pacific Ocean. 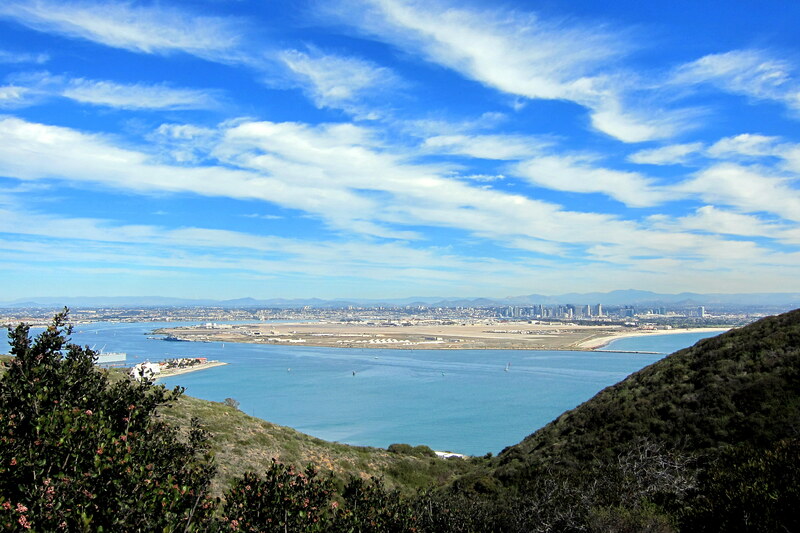 On a clear day, such as we enjoyed, the views are spectacular, both on the bay side…..
….. and the ocean side. It was an incredibly beautiful Southern California day to be out in the fresh air and we made the most of it. 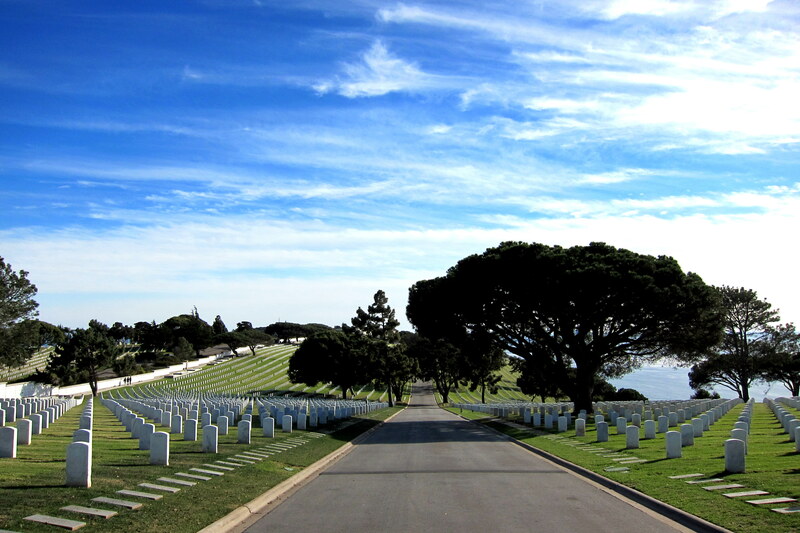 Also on Point Loma is Fort Rosecrans National Cemetery, a place of final repose for many members of our family. This solemn and dignified place makes one stop and ponder the veterans that have served our country with distinction. After paying our respects, we decided to cross over the Coronado San Diego Bay Bridge to the small town of Coronado, where on June 4th, 1965 Kit and I were married. 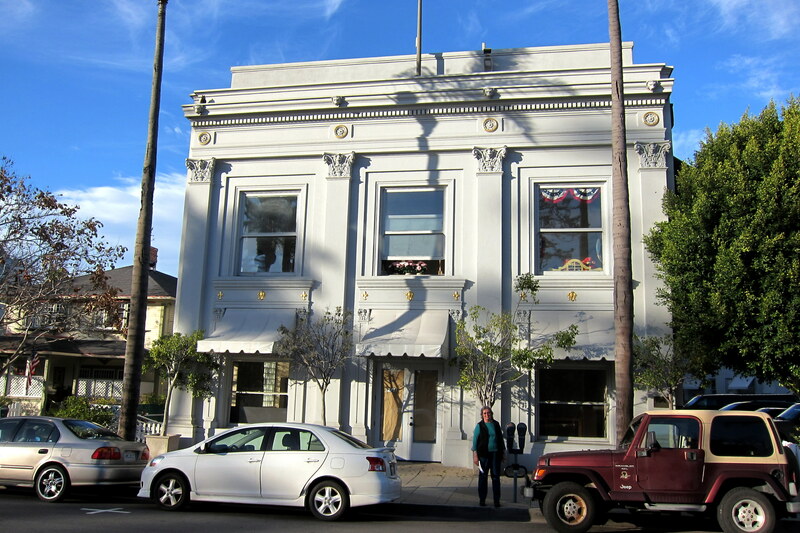 Our wedding ceremony was held at the court house, which in later life was a variety of commercial business. I had no clue what the address was or even where it was located….but Kit directed us right to the place! Women have an uncanny sense about stuff like that! Yep there it was in all its glory. 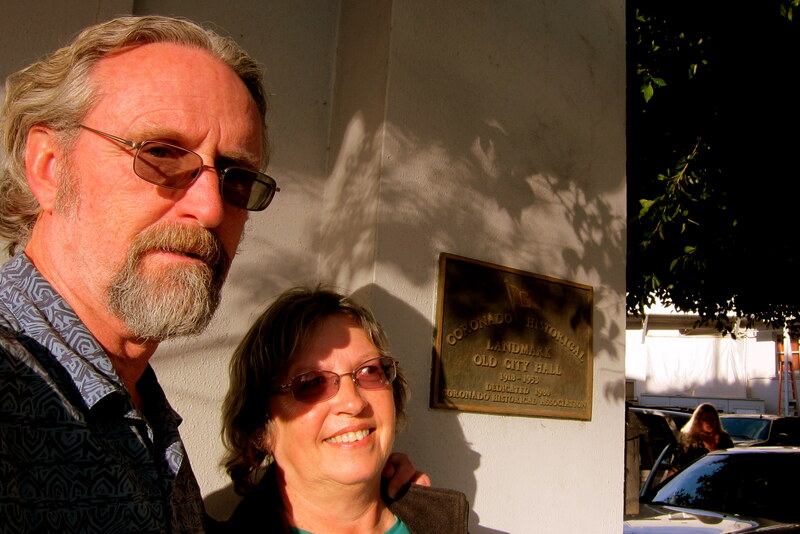 Forty Seven years ago, two young and scared kids started their life together…..and most folks didn’t think it would last! Kit’s sister and brother in law, who we visited in Texas a few weeks ago, have two children, Josh who lives in Colorado and Christopher here in San Diego. We were able to spend an evening with Chris at a really nice restaurant in Liberty Station, which is the former Navy Recruit Training Center. Chris is a Mechanical Engineer and works for Solar Corporation with their Gas Turbine Electrical Generation division. We had a nice visit and meal. If you’re in San Diego, and in the mood for great food, check out the Tender Greens Restaurant at Liberty Station. In addition to all the family and childhood friends in the area, there are a few folks that have relocated to San Diego from Maine. I worked with Scott for many years at Lockheed before retiring a few years ago. The project we were working on wound down so he and a few other Maine folks accepted Lockheed jobs in the area. 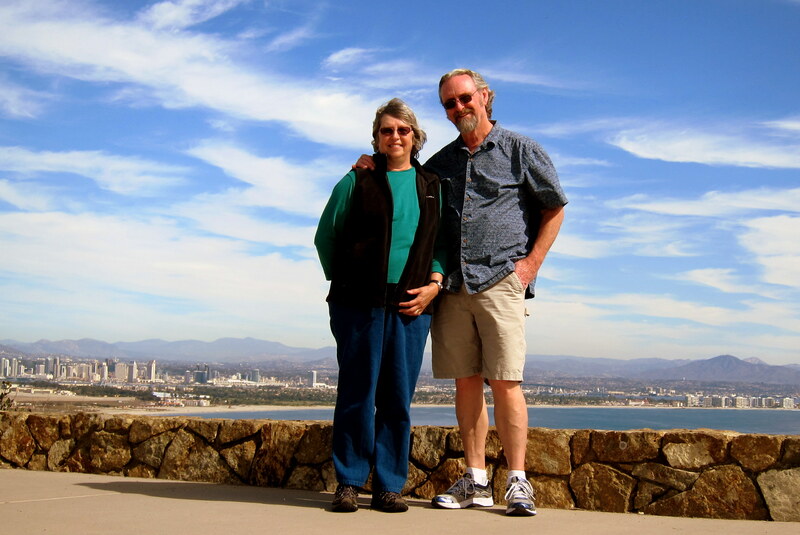 We visited them at their beautiful south San Diego home on a hillside overlooking the bay. We had a great time catching up on each other’s lives and sharing a nice meal. 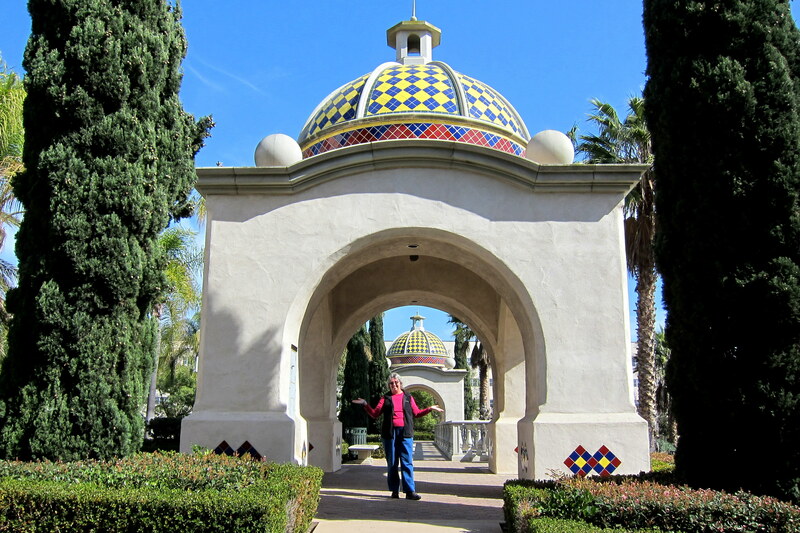 On another day, Kit and I went in search of where our daughter Suzie was born back in 1971…..yep, we have a child that old! And she’s not the eldest…..we have two creeping up on 50! 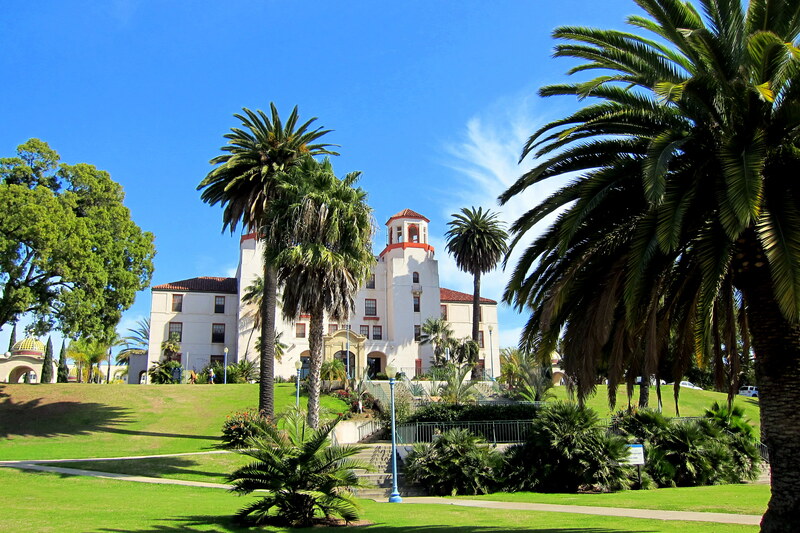 Anyway, the Balboa Naval Hospital isn’t a hospital anymore. When the Navy built a new state of the art facility a few years back the old complex was transferred to the city of San Diego. Attached to this old historic building was an addition that housed the Maternity ward. All that’s left was a few courtyard elements. The building is long gone…..sorry Suzie! Well, it’s been an all too short but thoroughly enjoyable stay in our old hometown. Tomorrow we crawl up the left coast in search of more adventures. Sorry to anyone we were not able to see this time around. There is just so much time and so much to see and do in this area! Hope to catch up with you on a future trip. Once again Bill – your photos are great. 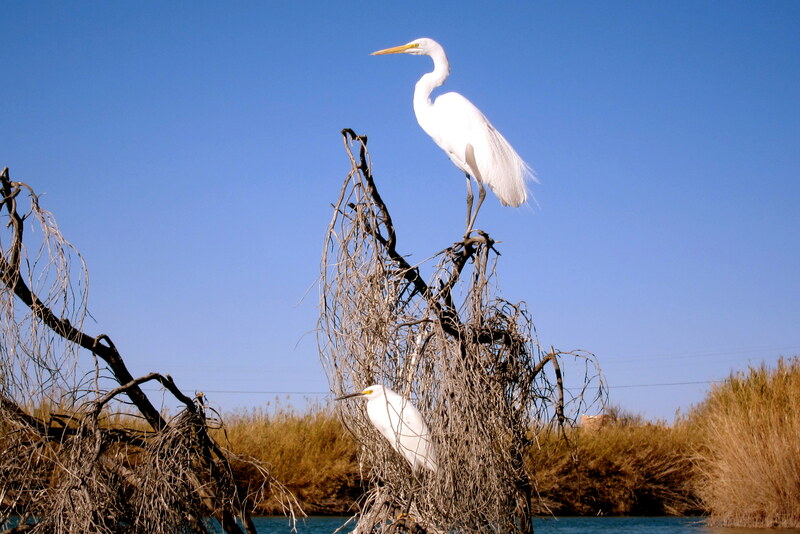 The first bird is indeed a Snowy, and the second a great egret. Keep up the good work. Thanks, Dave for the nice comment and the ID. 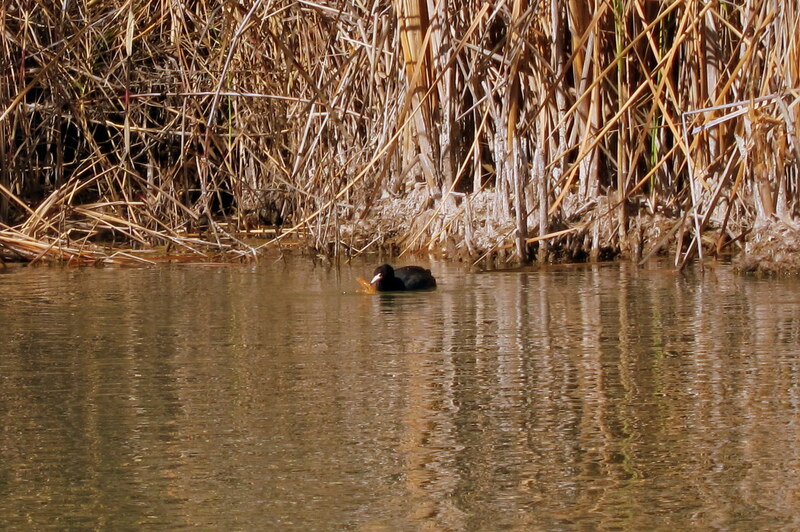 I have another interesting bird photo coming up in the next journal…..and a funny story to go along with it! Yeah Bill. The different beaks should have been your first clue. I see no mention of surfing. Try not to waste all that good Beach Boys music. Catch a wave. Thanks, Mr. Bird Brain! Being as you are a student of bird peckers, should have gone to you with the question in the first place. BUMMER! How does that always happen? Should we start taking missed opportunities like that personal?!?! Thanks for the nice comments, however! The only thing that floats on the ocean is a potential submarine target and sea scum. Yes I do lurk on your journal pages. WOW….after 133 travel journals I’ve posted on this website over the past five years and 742 comments various folks have made about those journals, I finally got you to submit one! Thanks, Brother!! 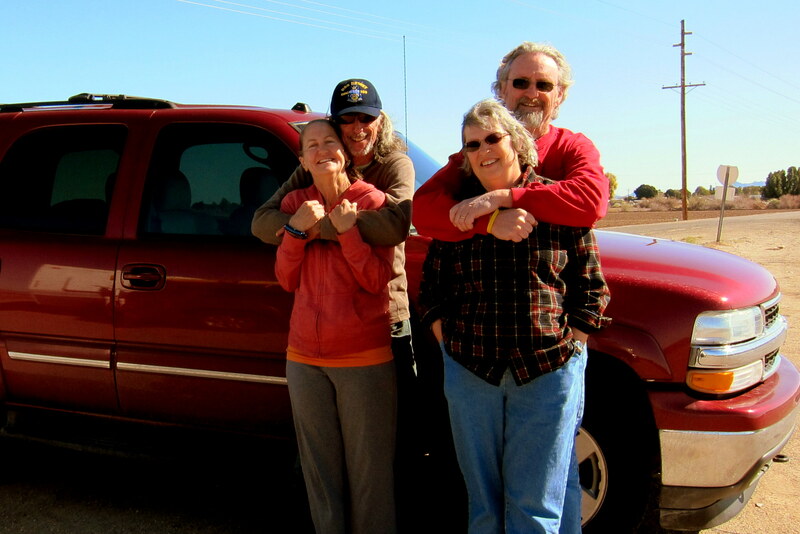 Well, good travelogue as always, and again, you missed seeing us at Yuma. You probably jumped off I-8 on Fortuna Road to link up on Hwy 95 north to Martinez Lake…we were parked just a couple miles towards Yuma from Fortuna! You are getting in trouble for not giving us a shout, Bill! Oh, one thing…they serve The Best Enchiladas at the restaurant at Martinez Lake..on Thursdays. Chuck and LeaRae can vouce for that. Hope to see you next time you pass through. Thanks for the comment. Yea, I was afraid we were pretty close at one point and was tempted to e-mail you folks. However we had a commitment in San Diego and cut ourselves a little short on time…..a situation we hate to be in by the way. We will be in the southwest for a few more weeks so…..who knows where we might show up? It was great to see SD—-Terry’s home port when he is in town. Don and I would like to visit there some day. You should visit! Even though San Diego has changed quite a bit since the 1950’s, it is still a nice place. In fact, if we were inclined to live in any large city in the world, San Diego would be it! I have some more photos of the area I’ll e-mail to you folks as a possible enticement to come for a visit. Great to hear from you and thanks for the comment and kind words. Tell all our Sage friends back in Maine we are well and will see them in the spring. Take care! Once again, the good weather is taking you around the west coast! We enjoy the pictures, especially the descriptions attached to the photos. Seeing all those P-3s was nastalgic – sure miss seeing and hearing them around BNAS. Thank you for letting us see over your shoulder and taking us along with you. Continued happy travels to you. Thanks for the comment and nice words about our little travel website. Take care of yourselves! You always seem to outdo yourself taking pictures which I find so amazing! 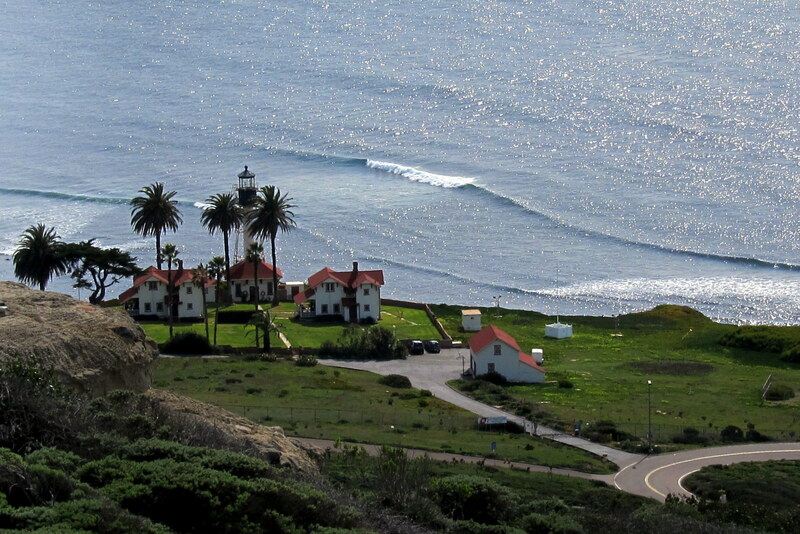 I love the shots of Point Loma and the Cabrillo Nat’l Monument….made me homesick for Maine! That is wonderful that you guys could visit where you actually got married! What memories that must have conjured up! As always, we like hearing from you and appreciate the kind comments about our website. Not sure where we are headed next but if we get anywhere near Prescott will give you a shout. So glad to see that the “car flotation device” got used. Miss you guys. Miss you as well! 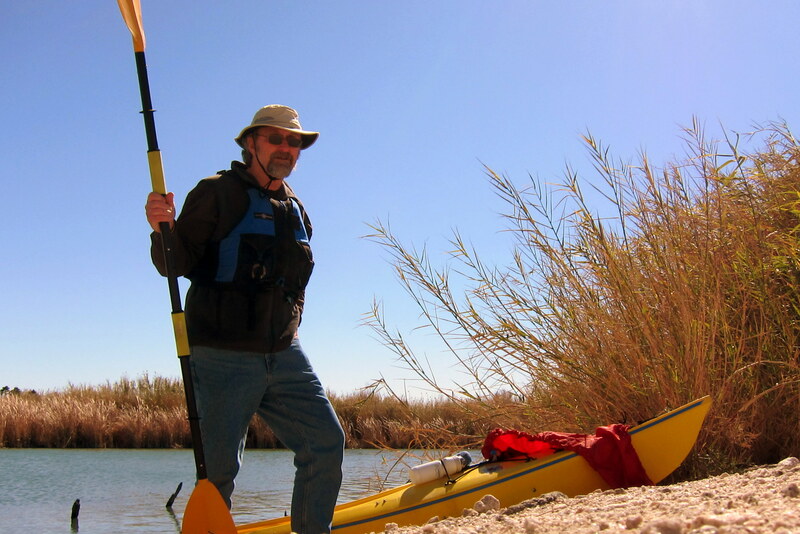 Yep, I was beginning to wonder if this was the year we might wander about the southwest and not find a suitable body of water to go paddling in! We were just talking about your annual journeys tonight with friends who are anxious to do the same with their new Roadtrek RV. Every installment I read makes me want to hop in our little Outback and meet up with you. Getting anxious to be in our new place. And soon after that we will all be back in Maine! Continue to enjoy your wonderful adventure. 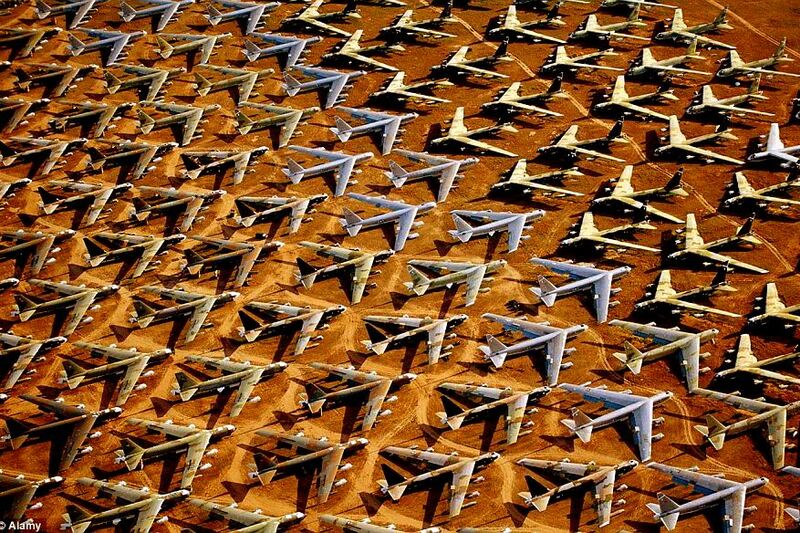 Oh, we remember driving by the Boneyard a few times, but never got closer than that. 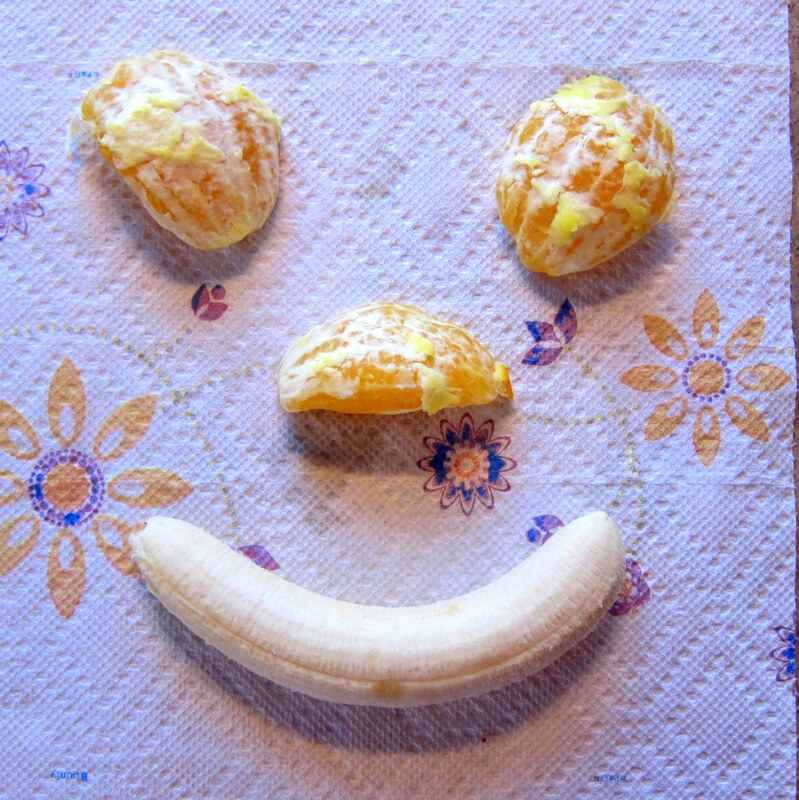 Great to hear from you…..hope all is well. Exciting about your new winter home, it looks to be a really nice place to escape the snowy north for a few months. Looking forward to seeing you folks back in Maine come spring! I did not realize you had such as artistic side. “Are you my breakfast or…..are you just happy to see me”? I think I will serve up your artwork for my children. Nothing better than “Edible Art! You two are having so much fun. I’m glad the weather has been good in San Diego. Ours here is crazy as usual. 30s at night and cold during the day. Now today it starts out in the 60s and will hit 81 with extreme winds. Never a dull moment. Weather has been great all along on this trip…..hope it continues! Hey, great to hear from you and thanks for the nice comments. I think you guys will really like San Diego, it has changed quite a bit since we grew up here but it is still very nice for a large city. Come check it out!